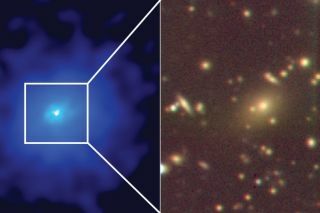 A bright quasar, PKS1353-341, shines out from a hidden galaxy cluster in this pair of images — the left in X-ray light and the right in visible light. Scientists have found hundreds of galaxies hiding in plain sight, cloaked by the light emitted from an extremely active supermassive black hole. The galaxies and blazing black hole can be seen in a new image released by the Massachusetts Institute of Technology (MIT). "The images are either all points, or fluffs, and the fluffs are these giant million-light-year balls of hot gas that we call clusters, and the points are black holes that are accreting gas and glowing as this gas spirals in," Michael McDonald, a physicist at MIT and co-author on the new work, said in the statement. The researchers theorize that the quasar at the center of this cluster is burning particularly brightly because it's on a "feeding frenzy." Huge chunks of matter are falling into the quasar from the disk of material surrounding it and causing the black hole to radiate large amounts of energy. The team estimates that the quasar is 46 billion times brighter than our sun. The immense light produced by this feeding frenzy is responsible for hiding the galaxies surrounding the quasar, but researchers believe that the overshadowing is temporary. Eventually, they expect the black hole's radiance to fade and to start looking like they expect other cluster galaxies to look. "This could be a blip that we just happened to see," McDonald said. "In a million years, this might look like a diffuse fuzzball." McDonald and his team first discovered a hidden cluster in 2012, and the mystery as to why they initially missed it sparked a search for similar objects. "We started asking ourselves why we had not found it earlier, because it's very extreme in its properties and very bright," McDonald says. "It's because we had preconceived notions of what a cluster should look like. And this didn't conform to that, so we missed it." In response, the scientists set up a survey called CHiPS (Clusters Hiding in Plain Sight) to re-examine X-ray images taken previously. So far, 90 percent of the data they've re-evaluated turned out not to be galaxy clusters, McDonald said in the statement. "But the fun thing is, the small number of things we are finding are sort of rule-breakers," he said. The new report published the first results from the CHiPS survey, which has so far only confirmed the existence of one hidden galaxy cluster. Yet, scientists expect to find more in the future and to be able to use the clusters to learn more about the universe's expansion. "Take for instance, the Titanic," McDonald said. "If you know where the two biggest pieces landed, you could map them backward to see where the ship hit the iceberg. In the same way, if you know where all the galaxy clusters are in the universe, which are the biggest pieces in the universe, and how big they are, and you have some information about what the universe looked like in the beginning, which we know from the Big Bang, then you could map out how the universe expanded."